* The word “Ecclesiarum” is deleted, while the “Delegato” is corrected in “Hungaro”. The Church never won a major victory than when she was not won by persecutions. Jean Alphonse Turrettini was born in Geneva on August 13, 1671, the son of the Reformed pastor François T. (1623-1687), and grandson of the theologian Bénédict T. (1588-1631). The ancestors of his old Patrician family had run silk manufactures and banks in Lucca, from where they moved out of religious conviction first to Lyon, then to Antwerp, to Zürich, and finally in 1592 to Geneva. Jean Alphonse studied at the academy of Geneva, and familiarized himself with Cartesian philosophy and with moderate rational theology. In 1691 he finished his studies and until 1693 he travelled in the Netherlands, England and France, where he made acquaintance with a large number of scholars. In London he fell ill, and this illness accompanied him until his death. In 1694 he became a pastor, and began his office in the Italian church of Geneva. He had a perfect command of English and Italian, both orally and in writing. He renewed the liturgy of service, introduced confirmation, and completed a translation of the New Testament. In 1697 he became professor of the recently founded chair of church history, and in 1705 professor of theology at the academy of Geneva. He wanted to relieve students from obligatorily signing the so-called "formula consensus", a declaration of agreement at their admission. He lectured on selected themes of theology and moral theology, in order to avoid the problems of systematic theology regarded by him as superfluous. In 1728 his students published in the Netherlands their notes recorded at his lectures, but he never acknowledged it for his own. He was a representative of patient, eirenicist theology. He did a lot at an European level for conciliating the Reformed and Lutheran branches of Protestantism, cooperating, among others, with the Archbishop of Canterbury William Wake. For these efforts he was awarded a golden medal by the King of Prussia. Later he was admitted in the Scientific Society of Berlin. He was a member of the Society for the Propagation of the Gospel. Encouraged by his friends, in 1737 he completed his great work on natural theology. His health quickly worsened, and died on May 1, 1737. His main works: Pyrrhonismus pontificius (disputatio in Holland, 1692). – Brevis et pacifica de articulis fundamentalibus diquisitio, qua ad protestantium concordiam mutuamque tolerantiam via sternitur, praes. Joh. Alph. Turretinus … resp. Jacobus Serces … Geneva, 1719. – De sacrae scripturae interpretandae modo, 1728. – Historiae ecclesiasticae compendium a Christo nato usque ad annum 1700. Geneva, 1734. – Orationes academicae … Geneva, 1737. – Cogitationes et dissertationes theologicae … Geneva, 1737. 2 tom. – Theologia naturalis. – Opera omnia theologica, philosophica et philologica. Leeuwarden, 1774-1776. 3 vols. This quotation from Sulpice Severe was probably intended by Turrettini as an allusion to the tribulations of the Reformed church in Transylvania. 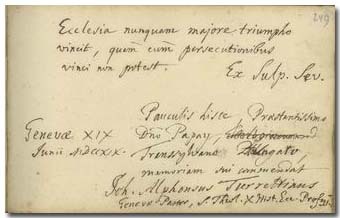 First he wrote his dedication like "… Papay, Ecclesiarum Transsylvaniae [?] Delegato", but then he corrected as "… Papay, Transsylvano Hungaro". Benedict Pictet (p. 213) corrected his dedication written on the same day in the same vein. – The above mentioned Archbishop William Wake wrote in the album in January of 1719 (p. 469).